Dukhtaran-e-Millat on Wednesday appealed the people especially majid Imaams to hold special prayers for the release of DeM chief Aasiyeh Andrabi. Andrabi was shifted to Delhi by NIA. 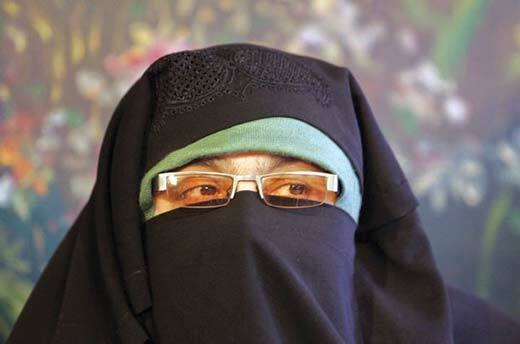 The spokesman in a statement said that party chairperson, Syedah Aasiyeh Andrabi, general secretary, Nahida Nasreen, press secretary Sofi Fehmeeda along with many others are suffering in jails because they have been raising their voices against the government in Kashmir. “Our leaders represent the muzzled voices of Kashmiris and government should keep this in mind that such tactics won’t make the Dukhtaran-e-Millat budge,” the spokesman said. “Our resolve gets strengthened with every passing day and Insha Allah, our patience will bear fruits soon,” she added. She further appealed people and Imaams to hold special prayers for the release of Andrabi Sahiba, Nahida Nasreen and Sofi Fehmeeda who have been detained by the NIA. Andrabi and two of her associates were shifted to Delhi by the National Investigation Agency (NIA) on July 06, 2018.